Following on from the previous article about wavy African American human hair extensions, there's one final texture to review - the regular wavy hair extension texture. A regular wavy texture is one that doesn't have an easy to spot wave pattern like deep wave or water wave but still has waves. This wavy texture is probably the equivalent of the body wave texture which in hair weaves is actually the loose wave texture (it's all to do with the fact that wefts 2d in nature due to being a thin line of hair and the larger wave patterns end up being slightly different to a wave pattern on a wig which is more a 3D object). Nevertheless, before we get down to business we're obliged to first give you the heads up about measuring length in wavy hair extensions. The length stated is the straight (stretched) length, not the wavy length. 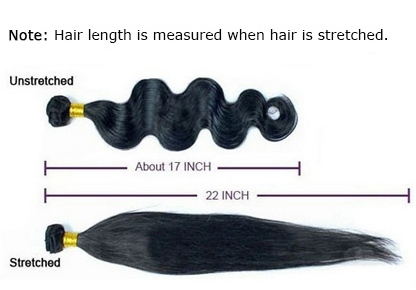 The image below shows a wavy 22" bundle of hair weave - when it's straight, it's 22" and when it's wavy the length is 17". There are of course quite a few wavy textures and although the body wave texture is popular it's not necessarily formulaic.... "What does that mean?" The body wave texture can come in different guises, some versions have very soft waves and others have sharper waves, like the image to the right. This is just a quirk of different interpretations by different suppliers, so always check the image of the wavy hair extensions before you buy as not all retailers accept returns. The body wave texture is popular because it adds bounce, volume and body without curls which makes it easy to manage and care for. It's a versatile texture that's available as hair weave extensions, fusion bonding hair extensions, clip in hair extensions and micro ring hair extensions. Although the body wave texture isn't straight, you can wash clip-in extensions using the sink washing method, braided extensions and weaves can use the braided extension washing method and micro loops can be washed using micro ring extension washing method. Human hair body wave extensions can be heat straightened and roller set for curls. Curling wands can be used to create curls, but the same advice given about loose waves above also applies here; excessive heat can damage the wave pattern of the hair. Although you can use heat to straighten, curling the hair isn't really ideal because it takes a lot of heat (you're essentially heat straightening to remove the waves and heat curling to add the curls). The extra time and heat needed to create curls from wavy hair can cause the wave pattern to become distorted and damage the hair (making it dry, brittle and prone to breaking or developing split ends). The body wave texture in all forms of hairwear, not just hair extensions and with so many variations, it's easy to see why it's not just African Americans (or those with Afro hair) who love soft body waves. If you're undecided about waves and are thinking about curls then check out the guide about curly textures for African American human hair extensions. Okeydokey, that's a wrap on wavy human hair extensions and if you have more questions about hair extensions why not check out the Your Hair Extension Questions, Answered section; or if you'd like to be first to read new guides and articles about wigs, hairpieces and hair extensions join our blog - it's easy to do and doesn't require any personal info.